Strolling into the corridor to convey the discourse was an "overwhelming knowledge," the speaker later reviewed, however, "we had projectors and a wide range of innovation to enable us to put forth the defense." The innovation is referred to as PowerPoint, the introductory programming created by Microsoft. The speaker was Colin Powell, at that point the U.S. Secretary of State. Powell's 45 slides showed scraps of content, and some were enhanced with photographs or maps. A couple even had installed video cuts. Amid the 75-?minute discourse, the tech worked impeccably. A long time later, Powell would review, "When I was through, I felt really great about it." The point of his discourse, before the United Nations Security Council on 5 February 2003, was to contend the Bush organization's last case for war with Iraq in a "ground-breaking route." In that, he succeeded. While the president had effectively chosen to go to war, Powell's discourse—indivisible from what might wind up a standout amongst the most renowned PowerPoint introductions ever—did nothing to crash the arrangement. The next month, the United States, United Kingdom, Australia, and Poland propelled their attack. "Avoidance and Deception": In a 2003 discourse to the United Nations Security Council, at that point U.S. Secretary of State Colin Powell put forth the defense for going to war with Iraq. The going with PowerPoint slides included satellite symbolism [top] that Powell said demonstrated mystery chip away at compound and natural weapons. 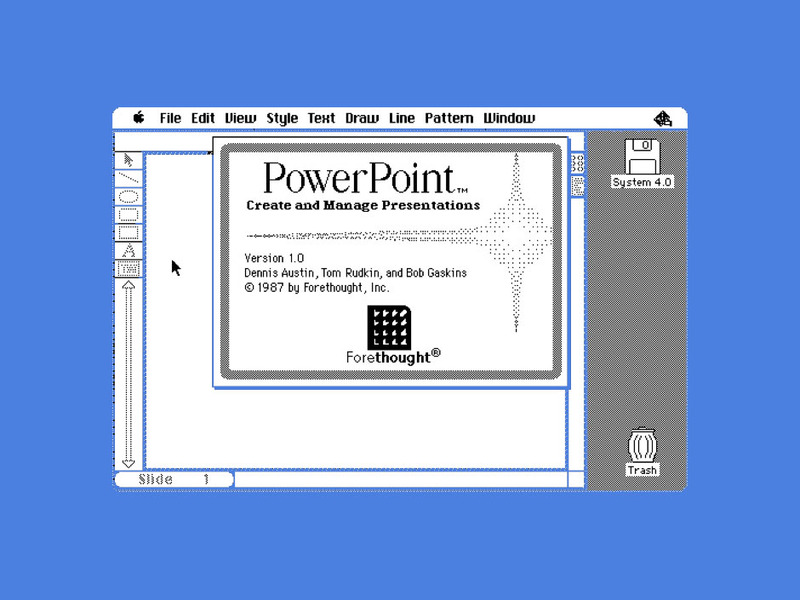 Powell's discourse performed how PowerPoint had moved toward becoming, by 2003, an almost unpreventable device of correspondence and influence in a significant part of the world. From that point forward, its control has just turned out to be more entire. A similar apparatus utilized by U.S. State Department and CIA authorities to turn a global alliance toward war is likewise utilized by schoolchildren to give classroom gives an account of planets, penguins, and writers. Microsoft properly gloats of 1.2 billion duplicates of PowerPoint everywhere—one duplicate for each seven individuals on earth. In any given month, around 200 million of these duplicates are utilized, and in spite of the fact that no one's truly checking, our total age of PowerPoint slides without a doubt achieves well into the billions. So significant is PowerPoint's impact that conspicuous figures have denounced the product's consequences for speculation itself. Edward Tufte, the master of data representation, has broadly railed against the "subjective style" of PowerPoint, which he portrays as having a "foreshortening of confirmation and thought" and a "profoundly progressive single-?path structure." PowerPoint is so imbued with current life that the thought of it having a history at all may appear to be odd. In any case, it has an extremely positive life as a business item that went onto the scene 30 years prior, in 1987. Strikingly, the originators of the Silicon Valley firm that made PowerPoint did not set out to influence introduction programming, to not to mention fabricate an instrument that would change assemble correspondence all through the world. Or maybe, PowerPoint was a recuperation from dashed expectations that pulled a battling startup again from the verge of disappointment—and prevailing past anything its makers could have envisioned. 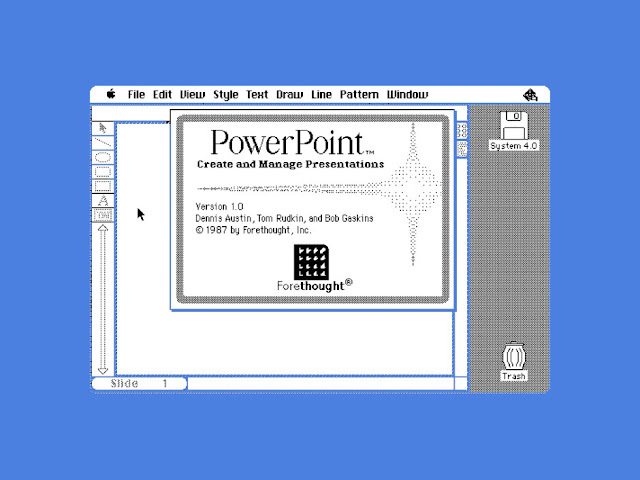 PowerPoint was not the principal programming for making introductions on PCs. Beginning in 1982, around about six different projects [PDF] went ahead of the market before PowerPoint's 1987 introduction. Its inevitable control was not the consequence of first-mover advantage. Furthermore, a portion of its most well-known highlights—the focal theme of a slide containing content and designs; bulleted records; the slideshow; the slide sorter; and even the vivified changes between slides—did not start with PowerPoint. But then it's turned into the Kleenex or Scotch Tape of introduction programming, as a "PowerPoint" has come to mean any introduction made with programming. With PowerPoint and additionally its antecedents, the theme of the slide was, obviously, lifted straightforwardly from the universe of photography. Some introduction programs really produced 35-mm slides for a show with a slide projector. Much of the time, however, the early projects made slides that were imprinted on paper for joining into reports, exchanged to transparencies for use on overhead projectors, or spared as advanced records to be shown on PC screens. The upshot was that PC clients of the 1980s, particularly business clients, had numerous choices, and the market for business programming was experiencing hypergrowth, with programs for creating spreadsheets, reports, databases, and business illustrations each constituting a multimillion-dollar class. At the time, pundits saw the expansion of business programming as another stage in office robotization, in which PC utilize was spreading past the bookkeeping office and the composing pool to the workplace elites. Both the envisioned and real clients of the new business programming were office laborers, from midlevel directors to Mahogany Row officials. PowerPoint in this way developed amid a period in which individualized computing was assuming control over the American office. A noteworthy quickening agent was the IBM Personal Computer, which Big Blue revealed in 1981. By at that point, bureaucratic America—corporate and government alike—was all around habituated to purchasing its PCs from IBM. This new type of machine, before long referred to just as the PC, spread through workplaces like fierce blaze. The preparation for that attack had been laid the earlier decade, in the 1970s technosocial vision of the "workplace without bounds." It began, similar to such an extensive amount what we presently underestimate in our contemporary universe of arranged individualized computing, at Xerox's unbelievable Palo Alto Research Center (PARC) [PDF]. The site was built up in 1970 to design the registering frameworks that would prepare the future's office, a field the organization wanted to rule similarly it did photocopying. Huge numbers of the splendid youthful PC researchers and specialists selected to work at PARC knew each other from the significant software engineering programs financed by the Department of Defense's Advanced Research Projects Agency (ARPA) at MIT, Carnegie Mellon, Stanford, UC Berkeley, the University of Utah, and SRI. In 1972, PARC specialists started to center around another PC they called the Alto. Driven by Alan Kay, Butler Lampson, Bob Taylor, and Chuck Thacker, they were charmed by an unprecedented thought: that in the workplace without bounds, each individual would have a committed PC like the Alto. Besides, these PCs would be arranged to each other and to other, bigger PCs, both locally and far away. This systems administration would frame a web of correspondence and processing assets well past the limit of any single PC. In the quest for this vision, Ethernet rose, as did the PARC Universal Packet convention [PDF], or PUP, a critical antecedent of the TCP/IP standard of the present Internet. The Alto's makers accentuated the machine's illustrations capacities, committing a great part of the PC's equipment and programming to rendering high-? resolution symbolism onscreen, including typography, illustrations, computerized photos, and activitys. It was a tremendous advance up from the standard PCs of the day, which still utilized punch cards, paper printouts, prints, and "moronic" terminals. Alto clients connected with it through a graphical interface to get to, produce, and control data. Indeed, even the content was dealt with as a picture. The PC was controlled through a standard console and the then-novel mouse that had risen up out of Doug Engelbart's SRI research facility. This graphical turn in processing was maybe most articulated in one of the Alto's modifying dialects, called Smalltalk. Created by Kay, Dan Ingalls, Adele Goldberg, and different associates, Smalltalk wasn't only a programming dialect; it was additionally a programming and client condition. It presented the graphical UI, or GUI, to individualized computing, incorporating an allegorical work area with covering windows, relevant and fly up menus, document programs, scroll bars, a determination by mouse clicks, and even cut, duplicate, and glue. After Apple: In 1982, Rob Campbell and Taylor Pohlman quit Apple to establish Forethought, with the goal-oriented objective of making a graphical-programming condition for the IBM PC like one created at Xerox PARC. At the point when their underlying arrangement fizzled, they rotated to different ventures, including introduction programming called Presenter. While such developments were apparently restrictive, before the finish of the 1970s, Xerox administrators and PARC staff were routinely talking about their discoveries with outcasts and distributing points of interest of the Alto framework in diaries. PARC specialists were, all things considered, still the piece of the more extensive ARPA people group of PC researchers and architects. Numerous guests who saw the Alto framework thought of it as transformative.